By Todd Abelson NMLS #180858 on December 3, 2018 . The stock market bounced back from its second correction of the year with the broader S&P 500 Index showing its best weekly gain since December 2011. Treasuries also prospered with the 10-year Treasury yield falling to its lowest level in over two months to move just below the noteworthy 3% level. The gains in stocks and bonds seem to have been precipitated by a speech made by Federal Reserve Chairman Jerome Powell on Wednesday. The softening in language likely stems from recent disappointments in economic data that would diminish the need for a steady pace of future rate hikes in 2019. However, another 25 basis point rate hike appears to be in the cards for December after Thursday’s release of the FOMC’s minutes from its November 7-8 meeting did nothing to dispel the notion the Fed will be hiking rates next month. The fed funds futures market is currently showing a probability for a December rate hike at 82.7%. 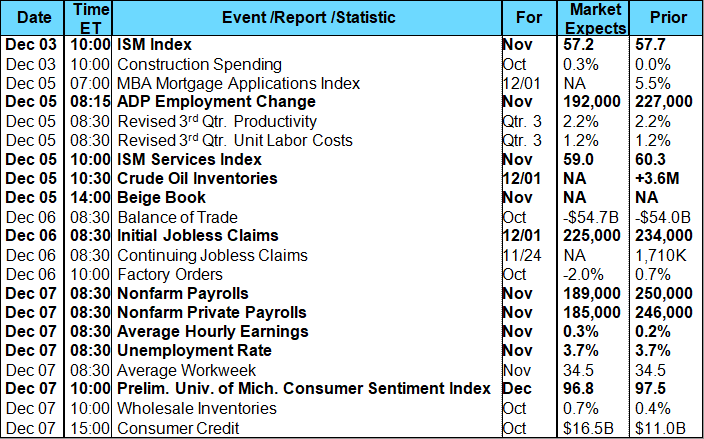 The week’s economic data were mixed. The Commerce Department reported New Home Sales fell by nearly 9% in October to their lowest level in two and one-half years. The decline was unexpected and a surprise given consensus expectations called for a 3.7% increase, although previous months’ sales were upwardly revised. Pending Home Sales also chronicled a surprising decline with home prices rising less than expected in September. Weekly jobless claims rose with their fourth consecutive increase, and a Midwest regional manufacturing index covering a nine-state region came in with a 50.6 reading, a five-month low, to miss Wall Street’s expectations by almost four points. However, on a positive note, Personal Spending (+0.6% vs +0.4% forecast) and Income (+0.5% vs +0.4% forecast) increased at a solid rate in October and exceeded consensus estimates. 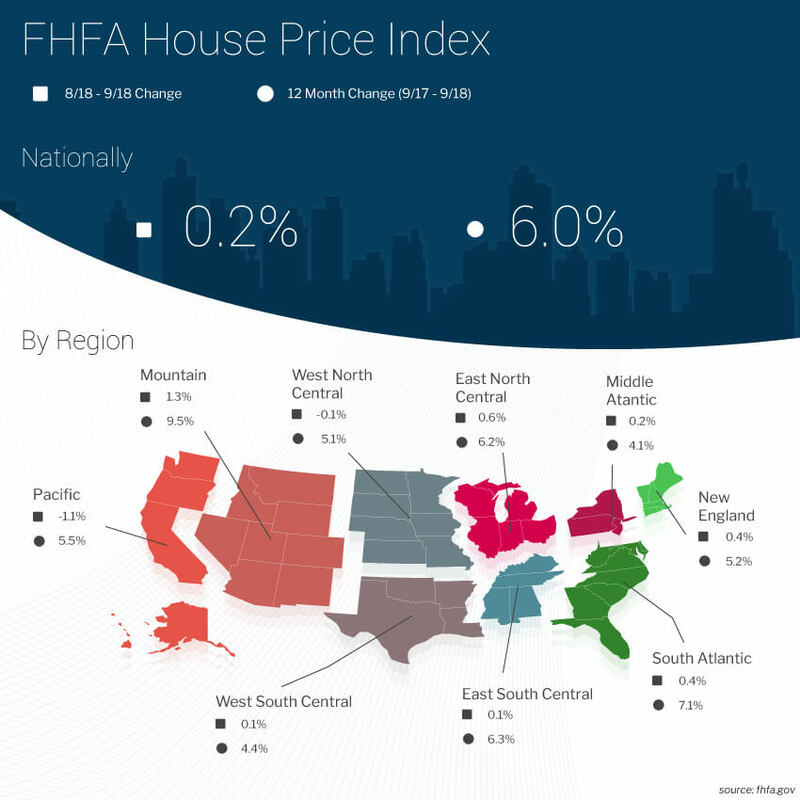 In housing, the Federal Housing Finance Agency (FHFA) released their House Price Index (HPI) last Tuesday showing house prices rose 1.3% in the third quarter of 2018. House prices rose 6.3% from the third quarter of 2017 to the third quarter of 2018. FHFA’s seasonally adjusted monthly index for September was up 0.2 percent from August. Home prices increased in all 50 states and the District of Columbia between the third quarter of 2017 and the third quarter of 2018. The top five areas in annual appreciation were: 1) Idaho 15.1%; 2) Nevada 15.0%; 3) Washington 10.6%; 4) Utah 10.0%; and 5) Colorado 9.2%. The areas showing the smallest annual appreciation were: 1) Alaska 0.2%; 2) North Dakota 1.0%; 3) Louisiana 1.5%; 4) District of Columbia 1.6%; and 5) Connecticut 2.2%. Also on Tuesday, the S&P/Case-Shiller 20-city index report covering the three-month period ending in September was released showing the index was flat on a seasonally adjusted basis in September compared to August. Although it was 5.1% higher compared to its level a year ago, it recorded its lowest annual increase in nearly two years. However, this appreciation level is still nearly double the rate of wage gains for the same time period. Regionally, the West remains the best with Las Vegas seeing prices appreciate 13.5% for the year as of September. Las Vegas was followed by San Francisco and Seattle. However, Seattle’s fortunes may be reversing as prices there lost the most on a monthly basis in September. The housing market is losing some steam as nine cities saw prices decline in September compared to August. 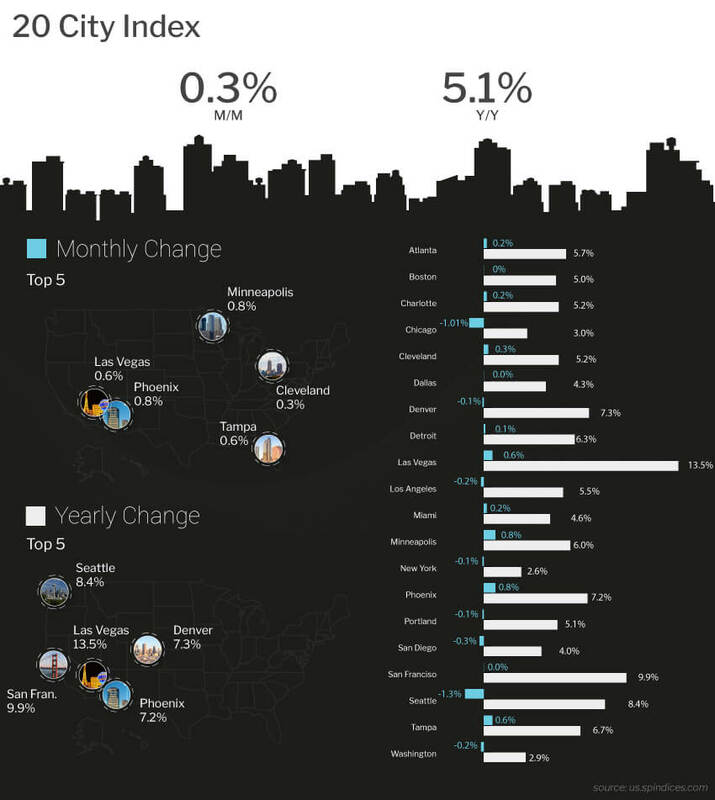 ShowingTime, a financial technology enabling more than 4 million property showings per month, indicated buyer traffic was 5% lower in October than a year ago, the third straight month of annual declines. Also, showing activity was lower in the South compared to a year ago for the first time in 12 months. In the West, showings were lower by double digits for the second month in a row. Wednesday, New Home Sales fell 8.9% month-over-month in October to a seasonally adjusted annual rate of 544,000 to come in below the consensus forecast of 575,000. September was upwardly revised to 597,000 from 553,000. Regionally, New Home Sales were 18.5% lower month-over-month, and 46.3% year-over-year in the Northeast; in the Midwest sales were down 22.1% month-over-month, and 16.7% year-over-year; in the South sales were down 7.7% month-over-month, and 11.6% year-over-year; in the West sales were down 3.2% month-over-month, and 1.3% year-over-year. At the October sales pace, there is a 7.4 months’ supply of new homes for sale, which is the highest supply level since January 2011. The increase in supply should foreshadow lower housing prices that will negatively impact profit margins for homebuilders. The median sales price in October was 3.1% lower year-over-year to $309,700 while the average sales price climbed 0.3% higher to $395,000. 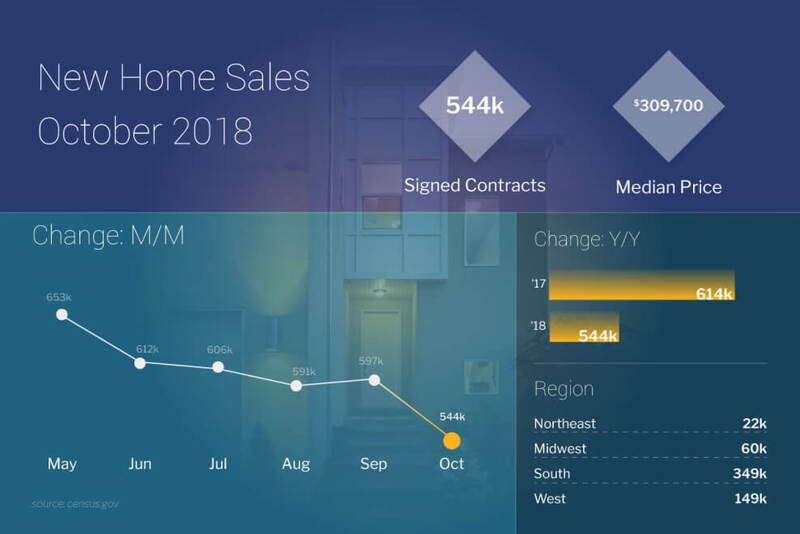 Thursday, the National Association of Realtors released their Pending Home Sales report showing sales falling to a four-year low, the latest sign of a housing-market correction. Sales fell 2.6% to a reading of 102.1 in October from 104.8 in September, the lowest reading since June 2014. The index, which tracks real estate contract signings, was down 6.7% compared to a year ago, missing the consensus forecast for an unchanged reading. 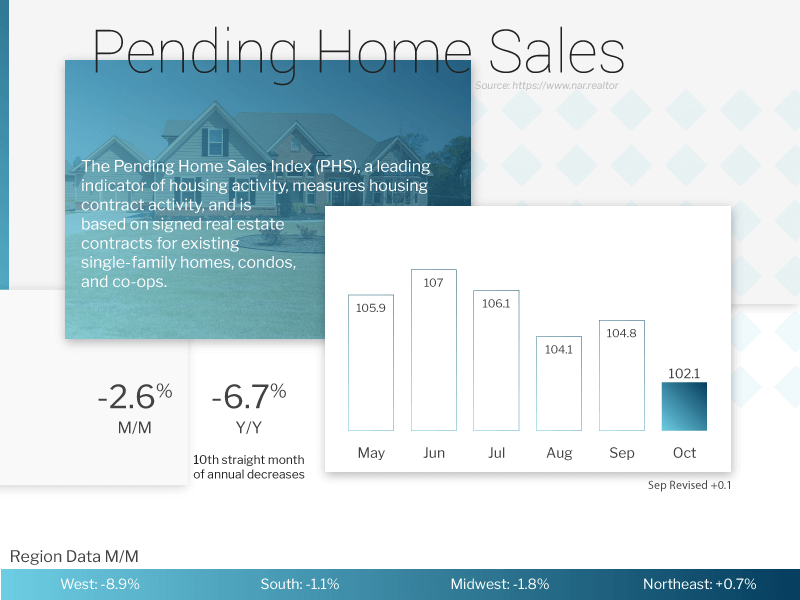 Contract signings usually precede closings by about 45 days, so the pending home sales release is considered a leading indicator for the existing-home sales report. Regionally, the only region to see an increase in Pending Sales was the Northeast by 0.7%. In the Midwest, sales dropped 1.8%; in the South they declined 1.1%, and in the West sales plunged 8.9%. As for mortgages, the latest data from the Mortgage Bankers Association’s (MBA) weekly mortgage applications survey showed the number of mortgage applications increased from the prior week. The MBA reported their overall seasonally adjusted Market Composite Index (application volume) rose 5.5% for the week ended November 23, 2018. The seasonally adjusted Purchase Index increased 9% from the week prior while the Refinance Index increased 1%. Overall, the refinance portion of mortgage activity decreased to 37.9% from 38.5% of total applications from the prior week. The adjustable-rate mortgage share of activity increased to 7.9% from 7.3% of total applications. According to the MBA, the average contract interest rate for 30-year fixed-rate mortgages with a conforming loan balance decreased to 5.12% from 5.16% with points decreasing to 0.46 from 0.48 for 80 percent loan-to-value ratio (LTV) loans. For the week, the FNMA 4.0% coupon bond lost 7.9 basis points to close at $100.234 while the 10-year Treasury yield decreased 2.8 basis points to end at 3.0460%. The Dow Jones Industrial Average gained 1,252.51 points to close at 25,538.46. The NASDAQ Composite Index advanced 391.56 points to close at 7,330.54. The S&P 500 Index picked up 127.60 points to close at 2,760.16. Year to date on a total return basis, the Dow Jones Industrial Average has added 3.31%, the NASDAQ Composite Index has gained 6.19%, and the S&P 500 Index has earned 3.24%. This past week, the national average 30-year mortgage rate dropped to 4.86% from 4.94%; the 15-year mortgage rate declined to 4.37% from 4.43%; the 5/1 ARM mortgage rate remained unchanged at 4.75% while the FHA 30-year rate fell to 4.37% from 4.45%. Jumbo 30-year rates decreased to 4.54% from 4.58%. The FNMA 30-year 4.0% coupon bond ($100.672, +43.8 bp) traded within a wider 70.3 basis point range between a weekly intraday high of $100.703 on Friday and a weekly intraday low of 100.00 on Tuesday before closing the week at $100.672 on Friday. Mortgage bond prices broke higher above resistance found at the 50-day moving average and in so doing moved up into an even more extremely “overbought” position than last week as measured by both the slow and fast stochastic oscillators. Both the %K and %D lines in the oscillators are measuring perfect “100” readings – they can’t go above “100.” Historically, the last two times over the past two years (06/06/17 and 08/31/17) when such extreme measurements occurred, bond prices trended substantially lower during the following month. The current chart shows bond prices could move a little higher before encountering stiff resistance and moving lower to test support at the 50 and 25-day moving averages. This scenario suggests mortgage rates could remain stable for a few more days before rising slightly higher over the next month.